The purpose of this page is to compile chess training material produced by outstanding female chess players. The exchange of chess pieces is a very important topic in chess strategy and to introduce this review lets quote Mark Dvoretsky “exchanges are undoubtedly one of the most complex elements of positional play. It was not by chance that an experience Soviet trainer gave this advice: If you are playing against a weaker opponent, exchange off some pieces. He will most certainly not understand which pieces he should exchange, and which he needs to keep on the board” (Positional Play, page 282). Indeed, pieces exchanges are not only important at GM level, but also at the below master level where most of us are ranked. Recently, WGM IM Elisabeth Pähtz (In Megabase her last name is spelled as Paehtz, keep this in mind to track down her games. In this article I will use Pähtz) released a ChessBase DVD on How to Exchange Chess Pieces. After a brief description of the author I will provide my opinion on the DVD content. 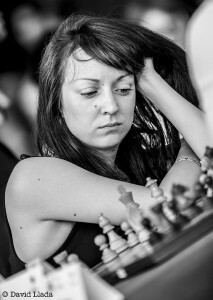 Elisabeth Pähtz is a resourceful chess player from Germany and her games despite the final result are a mix of tactical and positional battles. This is not a surprise since the Sicilian and French defense are part of Pähtz’s opening repertoire. My favorite games are Paehtz (2454) – Sadler (2660), Tata Steel 2012 , Markus (2655) – Paehtz (2454).Some of Pähtz’s games are used by Jacob Aagaard in his series Grandmaster Preparation (Positional Play, pages 48,52,170,258. Strategy Play page 268). In this DVD, Elisabeth Pähtz aims to help the audience to develop the “feeling for the right exchange”. To accomplish her goal the author explains how to exchanges chess pieces in the context of six major critical decisions during a chess game, named, piece exchanges in attacking positions, the structural aspects of piece exchanges, avoiding the exchange, exchange to realize an advantage, exchange of minor pieces in the endgame and the critical topic of exchanging queen. Next, the author illustrates the six scenarios mentioned above with the help of a good number of training positions from GM praxis. Finally, Pähtz helps her audience to incorporate the concepts discussed during the video clips with a set of test positions. The material is broken-down in a way that the class player can understand and apply the new knowledge to his/her own games (with one singularity, the game Ivanchuck- Aronian, Morelia 2007. This game is too hard to follow and grasp the ideas to surrender an open file…welcome to planet Ivanchuck). After going over the content of this DVD, double checking some of the statements from the author and using some of training positions with my students I reached two conclusions. First, conclusion is that the author made a significant contribution to the resources available on piece exchanges. Second, the Chessbase platform makes the learning process more efficient and suitable for busy audience. For example, after working on the training positions you can get a score for your answer by using a chess engine (Fritz 15 in my case) and discover nuances in your game. Use Fritz 15 to evaluate the variations you calculated during the test and check what was wrong or right with your variations. Did you found a good alternative to the author’s answer or you did figure it out the right answer but rejected it because you misevaluated the resulting position? I am glad WGM IM Elisabeth Pähtz took the time to develop this DVD to makes the topic of piece exchanges easier to understand to class players. I hope Chessbase is planning a follow up to this DVD with more games from Pähtz own praxis. While working on this review I played over some games by the author against 2600+ opposition and despite For instance, Short- Pähtz, Jakarta Open 2013. In this game versus former chess World Champion contender Nigel Short (a French defense expert by the way) Pähtz demonstrates how the right exchanges are use to secure a draw with black against a world class player as Short. A Biography of the First Women’s World Chess Champion with 350 Games is the latest effort by Robert B. Tanner. The author wrote a biography of the first Women’s world champion Vera Menchik plus all her games available at the moment. This work on the life and games of Vera Menchik fills a major gap in chess literature in the English language. In the past, only scattered games without historical context were available about Vera Menchik’s chess career. The book is a recommended choice to parents looking for an inspirational read to motivate female chess players at the K-3 level, players interested in positional chess or chess history. Finally, the chess games and annotations in this book can be use as chess training material, especially, the handling of closed positions by Menchik and her opponents are particularly useful. I am a coach with an interest in chess promotion among female chess players. A book in English on the career of a strong female chess player with a classic/positional style and deep core values that can be use as a role model was a pressing need. Vera Menchik A Biography of the First Women’s World Chess Champion with 350 Games provides chess students with a book that explains the conditions the first women world champion endure at a time of male dominance in the chess scene worldwide. Tanner’s work shows how a female chess player can overcome obstacles from society, chess peers and ill intended journalists with a positive personality, good results over the board and hard work. 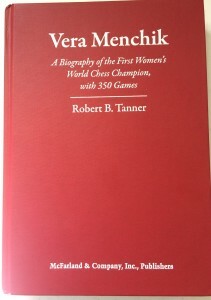 Tanner was able to write a book that clearly connects Vera’s development as a chess player with other leading female players of that time such as Mary Rudge and Sonja Graf. Together, the author shows why Vera Menchik was such an important figure in the popularization of chess among women and gives the first woman World Chess Champion the place in history she rightly deserves. Vera Menchik’s chess style was positional, but with a display of energy and drive. It is not a surprise that a strong positional player like Erich Eliskases was interested in publishing Vera’s gamesThe Times. Eliskases was a strong Austrian chess player that won twice the German Chess Championship (1938 and 1939) and was part of the German team that won first place at Buenos Aires 1939. After the II World War broke in 1939, Elikases decided to stay in Argentina and become a leading chess figure in this country and South America. In 1943 Eliskases published the book on positional chess “Decalogo del Ajedrez Positional”, a book that influenced the positional chess understanding of generations of chess players in Spanish speaking countries. That being said, it is not a surprise Eliskases was impressed with Vera’s positional play and submitted her games with annotations to the chess columnist of The Times, E.S Tinsley in July, 1936. Tinsley’s biased and unprofessional reply was an example of the unjustified treatment Vera endures from a segment of journals worldwide. In contrast, the annotations about Vera’s chess in the tournament book Moscow 1935 are more objective, despite Vera’s poor results. About the tournament Moscow 1935. Tanner suggested that Vera’s poor performance was influenced by factors no related to chess, but after looking at the book tournament an alternative explanation may be possible. I founded that Vera’s initial games showed an unusual degree of sharpness even as black against Botvinnik in game three (12…Nd4! 16…Qd6!) but as the tournament progressed and Vera did not score, she played less active and more conservative. In the rest of the tournament Vera consistently avoided to raise the level of sharpness of her chess even if the position on the board demands it. Vera’s opponents took advantage of her lack of dynamism to prevent her from scoring more points. For example, against Goglidze (9…Bb7 when the sharp 9…c5 will provide enough compensation for a pawn with an unbalance struggle ahead) and versus Pirc as white ( 14.Rc1?, 14 g4! with an attack against black’s king). All the evaluations were taken from the tournament book. In any case, I think that some chess authors used Vera’s results in this tournament to sell the wrong idea about her true chess strength. If you go over the list of players in Moscow 1935 with attention it is clear that the best players of the world were there and that at any tournament someone has to be last. As a chess coach, I find difficult to find modern chess games to explain positional concepts to very young players. Current chess praxis is fueled by computer assisted preparation and the nature of the game is way to concrete. A novice chess player may find taxing to grasp positional concepts in a pure form from a contemporary master game. After going over Vera A Biography of the First Women’s World Chess Champion with 350 Games, I founded that Vera’s games can be use to illustrate basic positional concepts in a pure form and that even her games prove to be a source to study the development of opening ideas! (some variations used by Vera Menchik still relevant today) Let’s take for example the game Menchik- Lasker, Moscow 1935. In this game after the sequence 1. d4 Nf6 2.Nf3 d5 3. c4 e6 4. Bg5 Nbd7 5.e3 c6 6.Nc3 Qa5 we reach the sharp Cambridge Spring variation of the Queens gambit declined. Vera’s choice was Bxf6 a move aimed to prevent black freeing moves c5 and e5. The same idea was played against my by Jorge Oquendo, a Cuban master that immigrate recently to the US (Oquendo, 2400 – Ararat 1880, Daytona Beach 2016). Oquendo used the same idea than Menchick employed against Lasker to prevent me from breaking free and slowly outplay me. In other words, the chess coach will find in Vera a Biography of the First Women’s World Chess Champion with 350 Games, a rich source of model games to teach positional chess to novice and intermediate chess players. This book is highly recommended and a must buy to parents and players below 2000 USCF level that struggle with positional chess.